In 1973, the National Knife Collectors Association developed a knife grading system that has been the standard for many years. Unfortunately, there are several grey areas in the original system, and now many dealers and collectors grade knives more like what is described in the table below. Mint: This would be a knife that has never been carried, never sharpened, never used, and does not have rust problems of any kind. 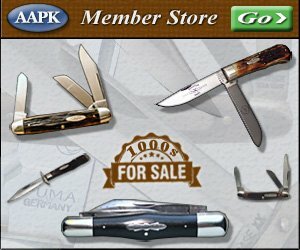 Some collectors will classify a very old knife that has a few rust marks as mint (especially those made prior to WWII). The newer the knife gets from there, the less rust specs it must have to maintain its mint status. In addition, most Case knife collectors are a bit stricter on grading knives. An old Case knife with any rust mark would not be considered mint. Note: A knife that had rust, and was cleaned to look mint would be considered near mint or worse depending on how harshly it was cleaned. Junk: Anything less than poor. These knives would be pretty much worthless. May have a liner, back spring or bolster that would be salvageable for parts, but probably not even that.